Yep, you heard right. We're going adult. Okay, so only for today. Why, do you ask? Well, because there's a soap maker that I'd love to introduce you to and she sells wedding & bachelorette party goodies. Some of those bachelorette parties get a little wild, you know. You just can't go showing some of this stuff to everyone, because when you give these kind of presents, you're trying to make the bride BLUSH... or groom, as the case may be. The artist behind all these creations Annelle Beecher, a nomad at heart who loves to work with scents. She's creative in more ways than one too! She also has a second shop on Etsy that deals with photos of beautiful and intriguing places. And as for those parties? If you're the one at the bachelorette party that likes to make the bride blush, this could very well be the shop for you. Pepper Apothecary is filled with scents to choose from and shapes that are sure to get you to your goal. So, check your ID at the door and go take a look for yourself! TO VISIT THE PEPPERAPOTHECARY SHOP YOU CAN CLICK THE PICTURE ABOVE OR, IF YOU'D RATHER, CLICK RIGHT HERE! I LOVE this shop. 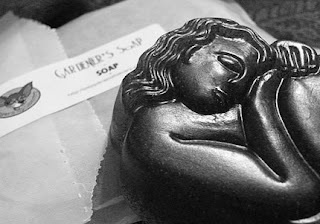 I will be ordering soap from her soon! :) I love the Marylin soaps! Awesome! O.K. now I am wide awake, better than caffeine I would say! And chuckles a plenty with good clean fun thrown in. What a great shop! Definitely a favorite - can't wait for the right gift giving occasion! Awesome. Thank you so much for the great review!! Made my day. Oh! Oh oh oh! Look at that! !